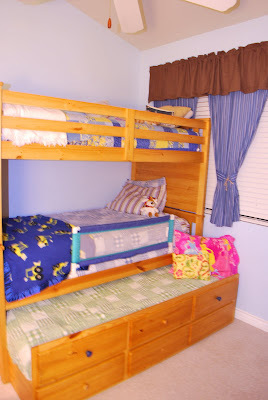 I think it's a bit absurd that most parents find it necessary to give each child their own room. If you are such a parent, I am sure you have your reasons. Hear me out, then ignore me. It's not personal, it's more a comment on the state of this country. My 3 kids have shared a room for all but 4 months of their little lives. Mckenna and Gabe's introduction to room-sharing was seamless. Juliana's was a bit (read A LOT) harder. But, we have persevered and now the 3 of them play and sleep in the same room. 1. They learn to get along, even when it's inconvenient. 2. They learn to play each other's games, to think of their siblings' wants and needs and not only their own. 3. They gain compassion for one another. When one is sad, scared, or frustrated the others comfort her. 4. They conspire, plan, consort, and get hyper together...oh wait, that's not why they share a room, it's a side effect. 5. They make memories together. There is nothing better than staying awake past bed-time (7:00 around here for this reason) and sharing, laughing, giggling, planning, dreaming and wishing with your siblings. 6. They grow closer--we often find the 3 of them asleep on the same bed. 7. It opens up our other room for other reasons. When we have extra room, God does things. It's that simple. The closet. 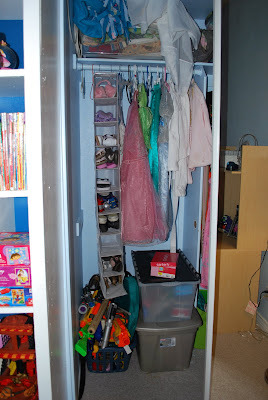 Hanging shoe rack and dress-up dresses, bins for dress-up, nerf guns, and big cars. The desk. Small, but gives Mckenna her own space. The beds. They rock. 3 beds in one, Juliana's pushes in, and the bottom drawers hold their PJs. Remember this custom Bookshelf? Still loving it! 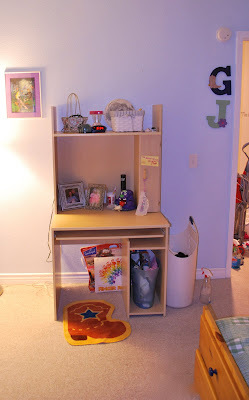 Holds all their toys and books, except what you saw in the closet. Mckenna's art shelves. A cute basket to keep them organized. Gabe's Puzzles (far left) and Legos. These white drawers are perfect for Legos. Each set gets its own drawer and he can take out one set at a time and build right in the drawer. Hat and Sunglass rack. Gabe's sunglasses are ALWAYS missing. Thank you, Thank you, Thank you for sharing. As Bill and I contemplate another baby, our 2 bedroom town house seemed a bit small. But I'm having a change of heart. Thanks! LOVE Mckenna's cowboy boot rug and hat/sunglasses rack! Where did you get that bed? PERFECT! 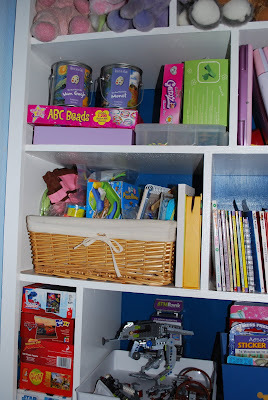 I don't suppose there are plans to that wonderful HUGE book/art/toys shelf? I love that there's a place for the plastic drawers! I'll be calling you when #2 comes along to find out how to keep #1 asleep before #2 is sleeping through the night! And no...#2 is not on the way, I don't think!! This is a good post. I remember getting a little frustrated when people would ask us...with every baby..."so when are you going to move to a bigger house"...We have 5...3 girls who share and 2 boys who share. You have made some really good points. I never thought about the compassion for others. But it's true, my kids are that way. The thing I notice is that it keeps us from buying/getting/keeping things we don't need. It has been good for the kids too. If they really want something but there's no room in the inn. They have to choose what to remove to make room. Anyway. Great post and a worthy soap box.